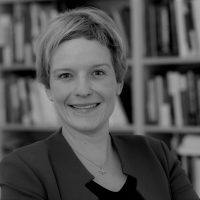 Almut Möller is currently the head of the Alfred von Oppenheim Centre for European Policy Studies at the German Council on Foreign Relations (DGAP) in Berlin. While there is a growing consensus that it is now unlikely that any country will leave the Euro. However, other groups suggest that parallel currencies for northern countries alongside the Euro may be better for Europe, but this is hotly contested.